When the Lost Tribes of Israel, led by Odin, came to the Baltic Sea, they divided themselves into two groups. One group went north across the Baltic Sea and became the ancestors of the Nordic tribes, such as the Danes (Daner), Swedes (Svear), Geats (Götar), and Norwegians. The other group went west across what today is Poland and became the ancestors of the Germanic tribes. The Danes are of the tribe of Dan and the Germanic Jutes are of Judah and Dan. The modern Danish people (Danskere) is made up of the proper Danes (Daner) on the numerous islands, and the Jutes (Jyder) on the Jutland peninsula, if recent immigrants, etc., are ignored. The original Danes were a Nordic tribe, while the original Jutes were a Germanic tribe. The Danes are of Dan, and the Jutes are of Judah and Dan. ”In the days of Pekah king of Israel came Tiglath-pileser king of Assyria, and took Ijon, and Abel-beth-maachah, and Janoah, and Kedesh, and Hazor, and Gilead, and Galilee, all the land of Naphtali, and carried them captive to Assyria” (2 Kings 15:29). ”In the ninth year of Hoshea the king of Assyria took Samaria, and carried Israel away into Assyria, and placed them in Halah and in Habor by the river of Gozan, and in the cities of the Medes” (2 Kings 17:6). These areas are almost identical to the areas where the oldest Norse chronicles state that the ancestors of the Nordic and Germanic tribes came from, before they trekked over Eastern Europe to Northern Europe. "Now in the fourteenth year of king Hezekiah (that was the Royal King of the Davidic line in Judah, in Jerusalem) did Sennacherib king of Assyria come up against all the fenced cities of Judah, and took them". What actually happened was that having taken ten-tribed Israel, and deported them to Halah and Habor by the rivers of Gozan, the cities of the Medes, the Assyrians deported the inhabitants of 46 fenced cities of Judah. (200,000 Judahites). That Bible account is borne out by the Black Obelisk of Shalmaneser in the British Museum, in the Assyrian Galleries. You will find the Assyrian evidence corroborates that along with our forefathers of ten-tribed Israel, went 200,000 Judahites as well. Those people migrated across the Crimea. They came through the land of Arsareth (modern Rumania) up the Danube Valley through Germany, through Scandinavia, to Britain. It wasn't just ten-tribed Israel, but also the descendants of 200,000 Judahites. Therefore a remnant of Judah was, and still is, present in Germany today, those who did not move on to the West. Not every Saxon, not every Jute, left Germany to come to the Isles. The Icelandic chief and historian Snorre Sturlasson (1179-1241) wrote Heimskringla (app. 1230), of which the first part is called the "Ynglinge Saga," wherein Sturlasson describes the homeland of the Nordic and Germanic tribes as the areas south and north of the Caucasus mountains. They were divided into two groups, Aser and Vaner, which obviously are the names of Asher and Dan, two of the Israelite tribes in the camp of Dan. “On the south side of the mountains which lie outside of all inhabited lands runs a river through Swithiod, which is properly called by the name of Tanais, but was formerly called Tanaquisl, or Vanaquisl, and which falls into the Black Sea. The country of the people on the Vanaquisl was called Vanaland, or Vanaheim; and the river separates the three parts of the world, of which the eastermost part is called Asia, and the westermost Europe” (Snorre Sturlasson: Ynglinge Saga pt. 1). The river Tanakvisl/Vanakvisl/Tanais must be the river Don, because its ancient Greek name was Tanaïs. In the Old Testament, the Danites named places after their ancestor Dan (Judges 18:12, 29), and Don also carries the name Dan. ”The country east of the Tanaquisl in Asia was called Asaland, or Asaheim, and the chief city in that land was called Asgaard. In that city was a chief called Odin, and it was a great place for sacrifice. It was the custom there that twelve temple priests should both direct the sacrifices, and also judge the people. They were called Diar, or Drotner, and all the people served and obeyed them. Odin was a great and very far-travelled warrior, who conquered many kingdoms, and so successful was he that in every battle the victory was on his side” (Snorre Sturlasson: Ynglinge Saga pt. 2). “the ancestors of us, the Germans, and the Celts lived together in Asia Minor” (P. F. Suhm: Om Odin og den Hedniske Gudelære og Gudstieneste udi Norden (1771), p. 140-141). The Norwegian explorer Thor Heyerdahl also confirmed Snorre Sturlasson’s account in 2002, when he published Jakten på Odin (The Search for Odin), wherein Heyerdahl specifically wrote that the ancestors of the Norsemen came from Azerbaijan. There were several Odins. Suhm writes of at least three different Odins. Odin was most likely not a name, but a title, which meant something like “lord, chief, no. one or prime minister”. In Russian, Odin means “one”. I have asked a Russian lady about this, and she confirmed it. When the lost tribes, led by Odin, came to the Baltic Sea, they divided themselves into two groups. One group went north across the Baltic Sea and became the ancestors of the Nordic tribes, such as the Danes (Daner), Swedes (Svear), Geats (Götar), and Norwegians. The other group went west across what today is Poland and became the ancestors of the Germanic tribes. From the context, it seems that by Vanaheim is meant Denmark. The Gothic historian Jordanes writes in De origine actibusque getarum (The Origin and Deeds of the Goths, 551 A.D.) that the Danes came out of the Swedes. (The original Swedes and the Geats later formed Sweden.) The Danes were of the tribe of Dan, who came to the Scandinavian peninsula along with the other tribes of Bilhah and Zilpah, Naphtali, Asher, and Gad. The original Jutes, on the other hand, were of the tribe of Judah, who along with other tribes of Leah made up the Germanic tribes that settled on the European continent and the Jutland peninsula. Suhm writes that around 235 A.D. Dan Mikillati, king of the Danes in Scania and Halland, was also crowned as king of the islands Zealand, Funen, Møn, Falster, and Lolland. When the Jutes and the Angles were invaded by the Saxons, Dan Mikillati succesfully helped them, and for this the Jutes and the Angles also crowned him as king in Viborg in Jutland (P. F. Suhm: Historie af Danmark (1782), p. 103-112). Danmark -- the Danish name for Denmark -- means “the Danes’ borderland”, because “mark” meant borderland. Danmark was originally the name for Dan Mikillati’s kingdom in Scania and Halland, but eventually became the name of the entire kingdom. The Danish historiographer Iver Nielsen Hertzholm (1635-1693) wrote that the Danes’ and Denmark’s name comes “from the Hebrew word Dan: meaning to judge, investigate, and believes that we are called so because of our wisdom” (according to P. F. Suhm: Critisk Historie af Danmark (1774), p. 144). “And there went from thence of the family of the Danites, out of Zorah and out of Eshtaol, six hundred men appointed with weapons of war. And they went up and pitched in Kirjath-jearim, in Judah: wherefore they called that place Mahaneh-dan unto this day: behold, it is behind Kirjath-jearim” (Judges 18:11-12). “And they built a city, and dwelt therein. And they called the name of the city Dan, after the name of Dan their father, who was born unto Israel: howbeit the name of the city was Laish at the first” (Judges 18:28-29). When the tribe of Dan, called Vaner and Taner, trekked across Eastern Europe, they likewise seem to have named several major rivers after themselves. The river Don, by the ancient Norsemen called Tanakvisl and Vanakvisl, and by the ancient Greeks called Tanaïs, has already been mentioned. Other major East European rivers with the prefix D-n are: Donets, a tributary to Don. Dnieper, which by late Greek and Roman authors was called Danapris and Danaper respectively. Dniestr, which by the Romans and Jordanes (6th century AD) was called Danastris and Danastus. The Danube, which in German, Danish, and other languages is called Donau. The Jutes were originally a Germanic tribe which later became Nordic. (See P. F. Suhm: Historie af Danmark, Vol. 1 (1782), p. 26 and 109, and P. F. Suhm: Critisk Historie af Danmark, Vol. 1 (1774), p. 172-173, and here.) The Jutes came to Jutland from Germany, while the Danes came to the isles from the Scandinavian peninsula. 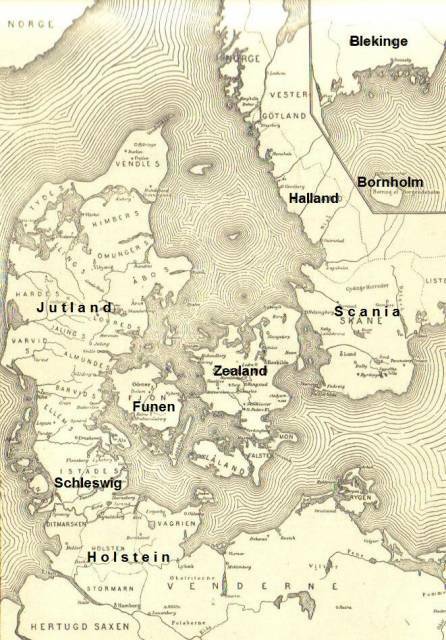 The Angles and the Saxons, two other Germanic tribes, settled in the southern parts of the Jutland peninsula. When Denmark today genetically is 60% similar to the ancient Vikings and 40% similar to the ancient Germanic tribes, the Israelite tribe of Dan must make up the 60% Viking part and the Judah-Jutes must make up the 40% Germanic part. In the 5th century A.D., when the earth in Jutland was exhausted and could not support the population, the Jutes invaded England along with the Angles and the Saxons. In these invasion are not mentioned any Danes. The Danes and the Norwegians only invaded the British Isles in the later Viking Era (8th to 11th century). The tribe of Dan’s future is shrouded in mystery. The tribe of Dan is, as the only tribe of Israel, not among the sealed 144,000 male Israelites (Revelation 7:4-8) that are going to reign with the Lamb and God. Revelation does simply not state why the tribe of Dan is not among the 144,000. The 144,000 are the co-rulers and are compared with the first-fruits (Revelation 14:4). The first-fruits was a small ceremonial offering at Pentecost (Exodus 34:22, Leviticus 23:15-17). All the inhabitants of the coming Kingdom of God are, on the other hand, compared with the normal harvest (Luke 10:2). The normal harvest takes place in the autumn, and is immensely larger than the first-fruits in size. That the tribe of Dan is not among the 144,000 does therefore not mean that the tribe of Dan is going to perish. Snorri Sturlasson: Heimskringla or the Chronicles of the Kings of Norway translated by Samuel Laing (London, 1844) Mikkel Stjernholm Kragh has made a few corrections to the English translation.